Double X Science: Aren't you curious? She’s going to be blogging on the Forbes network, see her here, and I’m guessing this was the impetus for that particular set of questions.I had much to say in answer to her questions. Articles rarely cite their scientific sources- i.e. linking to the actual journal article they are writing about. For instance, the craptastic example above where the ‘journalist’ (how’s that for quotation marks?) not only failed to link to the original article, he didn’t even mention the journal it was published in, when it was published, or any other info (other than the lead author’s name) that would help a reader find the journal article or additional info on it. As for sources, it's important to distinguish for the reader between peer reviewed journal articles and mere opinion pieces on blogs. Take for instance the blog post I wrote about here that appeared on the website of Psychology Today. Many news outlets picked it up and touted it as research that showed it was dangerous to let your infant ‘cry it out’ when really it was just a post (poorly researched, lacking citations, and full of unsupported conjecture and opinion) on the blog of a psychologist. A blog post is NOT the same thing as a peer reviewed journal article. Please journalists, know this! Another gripe, accuracy is sacrificed for the sake of brevity, which completely defeats the purpose of sharing the science. See above yet again about smallpox as a ‘cure’ for breast cancer. Another problem I have is the way the media handles funding sources for research studies- they always matter, it’s imperative that scientists report any conflicts of interest that funding sources might prove to be. However, they are not always a sign that researchers are ‘in cahoots’ with the companies that fund them. For instance, would you trust RJ Reynolds to fund unbiased research on smoking and cancer? Probably not. Thus, if at the end of a research article you see a company with a known bias and the findings support their assertions, you are right to be skeptical. However, sometimes the funding merely means a company paid for work to be done, regardless of the outcome. For instance, a pharma company that partners with an academic lab on basic science and published the results in a peer reviewed journal. Or, a drug company that funds the clinical trials for it’s drugs. That’s just the way it works- who else would fund the trial if not the manufacturer? If those types of studies are published in peer reviewed journals, they have been vetted to that extent. Further, with clinical trials, the Federal Drug Administration (FDA) oversees all those trials to help ensure they are unbiased and protect the patients involved as well as the public as a whole. The media seems unable to distinguish. As for how I generally consume science/scientific information? It’s usually as follows- hear about it on the radio or read a lame article via Yahoo News/Strollerderby/The Stir/etc., assume the author is either full of bologna, got the science partly/mostly wrong, had their more level-headed title replaced by an editor, is totally biased, etc., then I track down the original research article, and possibly seek out commentaries on the work from reliable sources (SciAm blogs, Double X Science, fellow scientists, etc.). What about how I use it? Well, obviously I’m a scientist, so I ‘use’ science/scientific information professionally every single (work) day to try and cure (no quotation marks) and/or treat cancer. In my personal life, science helps me make healthcare decisions for myself and my family, decide which products to buy or to avoid, answer questions about the natural world when my toddler asks, as material to blog about and use to dispel misconceptions held by myself and others. However, a lot of the time I don’t necessarily even use the science I consume. Sometimes I just want to know it. I’m curious. Pretty frequently people ask me, “How do you know that?” or “Why do you even know that?” I’m not sure how to answer. If it’s a medical question, a lot of the times the answer is, “Well, I have that body part and I want to know how it works.” Or, “Well, I’m taking that medicine, so I looked up how it works.” People forget that science is the basis of everything- it’s how everything works or came to be. While others seem to find it odd that I’m always looking up the science behind was I see/do/hear about, I find it odd that other don’t seem to question enough. You’re taking that medicine, you’re having that surgery, you’re using that product right now- don’t you wonder how/why it works? Why aren’t you wondering? 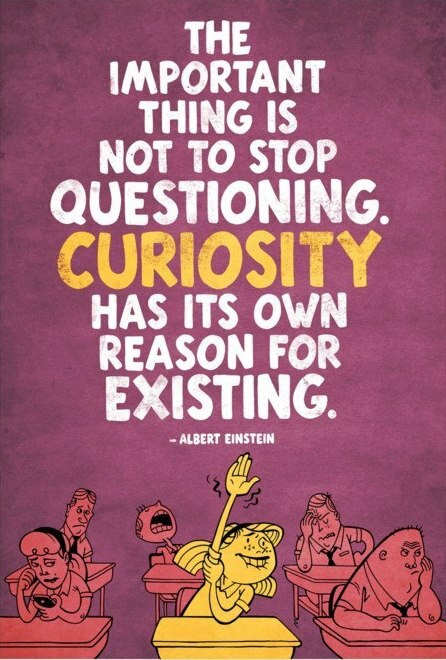 Where’s your curiosity? Don’t you just want to know why the sky is blue? How did you came to be? Why are roses red and violets blue? Courtney Williams is a scientist, wife, and mother (in no particular order). She works in the oncology department of a biotech company in the burbs of NYC. She blogs about marriage, motherhood, and science at http://mommacommaphd.wordpress.com/.